This whisky has a label with a dog carrying a small barrel around his neck that supposedly contains an alcoholic liquid. What's the history and the purpose? Well, according to the leaflet this whisky is a hommage to (ancestors of) the St Bernard dogs that rescued people in the Alps. First records go back to 1707. Allthough we know now that the last thing you should do is providing alcohol to a hypothermic person (the veins will open up and loose even more body warmth), back in those days it was considered the obvious thing to do. People of The Whisky Specialist claimed to have found the drink as it was in the old days in a small Swiss village. The recipe was kept a secret, but with experimenting and blending they have tried to somehow recreate the taste of the old drink that used to be in the barrel carried by the rescue dogs. 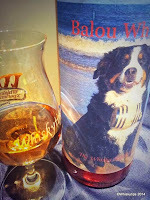 So on the label you will find a Berner Sennen dog, named Balou (this specific race was probably more likely the type of rescue dog in the old days) with a small cask. That a great story of course. But what's in the blend? The man in the shop only revealed that it's a blend of malt whiskies. If we were to guess we'd say Mortlach (spicy), Glen Grant (butter, vanilla) and a wee drop of Benromach Burgundy Finish (smoke, dry, wine tones). More important: how does it taste? Well, it's a real spicy dram, very nice for winter time. There's a hint of (Spanish or Portugese) wine there, that oaky, dry taste. Still a few bottles available for the very decent price of € 31,95. We'll just have another sip. Sláinte Balou!